OX Pro Heavy Duty Bar Clamp 150mm / 6"
OX Pro Heavy Duty Bar Clamp Features Size: 6" / 150mm. Highly durable, heavy duty c..
OX Pro Heavy Duty Bar Clamp 450mm / 18"
OX Pro Heavy Duty Bar Clamp Features Size: 18" / 450mm. Highly durable, heavy duty ..
OX Pro Heavy Duty Bar Clamp 600mm / 24"
OX Pro Heavy Duty Bar Clamp Features Size: 24" / 600mm. Highly durable, heavy duty ..
OX Pro Heavy Duty Bar Clamp 900mm / 36"
OX Pro Heavy Duty Bar Clamp Features Size: 36" / 900mm. 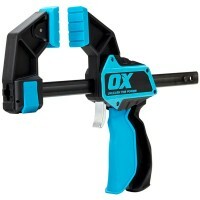 Highly durable, heavy duty ..
OX Pro Heavy Duty Bar Clamp 300mm / 12"
OX Pro Heavy Duty Bar Clamp Features Size: 12" / 300mm. Highly durable, heavy duty ..